This fine 1791 map by Robert Wilkinson details the Counties and Duchies of Austria. It covers from Lake of Constance eastward to Hungary and south as far as the Adriatic Sea. The map includes Vienna, the traditional seat of the House of Habsburg and, usually, the Holy Roman Emperor. The 'circle' in the map's title refers to an 'imperial circle,' one of the administrative units created primarily for tax and defense purposes by the Holy Roman Empire. The Napoleonic Wars would, of course, dissolve the Holy Roman Empire and lead to the consolidation of Germany in 1871, with a separate Austria. 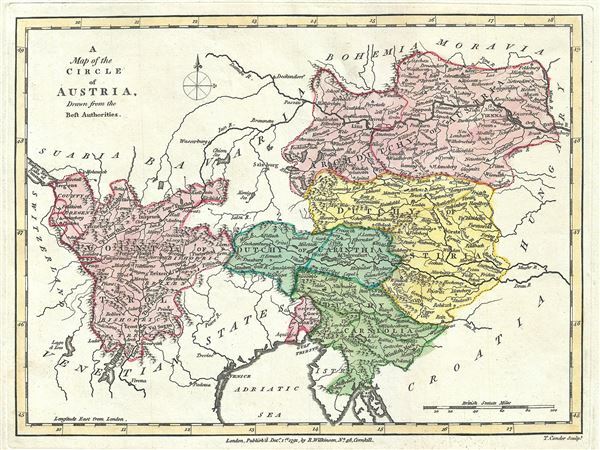 The Circle of Austria was, as shown here, bordered by Swabia, Bavaria, Bohemia and Moravia to the North, to Switzerland on the west, the Venetian States, and the Adriatic, to the south, and Croatia and Hungary to the east. This map was engraved by Thomas Conder and issued as plate no. 24 in the 1792 edition of Robert Wilkinson's General Atlas.